The Composite Video Extender sender unit connects to any component video source using the supplied Composite cable. The receiver unit connects to your composite video display up to 1,000 feet away. One CAT-5e cable is used to connect the sender to receiver for perfect video extension. 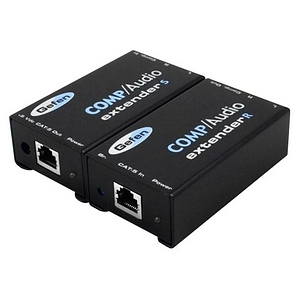 The Composite Video Extender can extend either 3 composite video signals or 1 composite video signal plus 2 audio.